Well, the main issue was that I didn't notice that the doors were open, so my Lanius took all the oxygen and everyone died. I think I prefer the medbay over clone bay. If one of your systems is hacked, is there anything you can do about it? Last night I was taking on the flagship and my weapons got hacked - I couldn't do anything but sit and wait. My eventual strategy became mind controlling someone and hoping they could do a point of damage by destroying a system before someone came to fight them. That worked less well than I would have hoped. So is there another option, besides being more diversified or getting lucky that they hack something less important? I guessed the ship would run out of drone parts eventually, but I feel like I survived a long time with no sign of that happening. Gwydion wrote: If one of your systems is hacked, is there anything you can do about it? Last night I was taking on the flagship and my weapons got hacked - I couldn't do anything but sit and wait. My eventual strategy became mind controlling someone and hoping they could do a point of damage by destroying a system before someone came to fight them. That worked less well than I would have hoped. Hacking a hacking system shuts down the opponent's hack and destroys their drone, so they target it somewhere else. Besides hacking the hacking system, nope. Hacking is a powerful tool, but unlike your other offensive systems, it doesn't do any actual damage by itself. I was able to survive a flagship weapons hack by being really lucky, because I happened to be doing a boarding offensive that run anyway, and so didn't even *use* my weapons until the very end (after my boarders had already destroyed the hacking system). Also, if you get hacked in a bad spot on the end boss, and can't deal with it through other means, you can jump away from the fight and come back again. Soralin wrote: Also, if you get hacked in a bad spot on the end boss, and can't deal with it through other means, you can jump away from the fight and come back again. So has anyone used the battery pack? how well does that work? Depending on your build the battery pack can be really useful, especially if you don't have Zoltans. For example, I've used it to power my oxygen during a breach so my repair crew wouldn't stop breathing, or to heal crew faster for a few minutes. Other options include powering that fourth shield or getting more dodging during a power surge. You can also use it to power your cloak or mind control briefly. I don't recommend it for weapons or drones, as the energy is too short-lived. It's not as helpful in the early game, when you can buy permanent energy for the same price or close to it. I don't have many unlocked, but so far I like Engi B the best. It's main disadvantage - the single crew member - can be easily overcome by making sure that you have around 65 scrap each time you enter a store and buying a new crew member. Not only that, but the heavy laser is an very powerful early-game item.The heavy ion stuns shield long enough to fire off two h. laser shots, so you can disable weapons and then take out a shield level before they go back up. If you had a med bay (or reconstructive teleport), then you could bypass this problem by waiting for both enemy crew to be alive, then sending your boarders to damage all the enemies, but not kill any of them. Teleport back home, heal up, then repeat until you can kill them all in less time than it would take the clone lab to revive one. Since they have a clone lab, that presumably means they don't have a med bay, so can't heal themselves between boardings. I don't know if that actually wins, though - it might still not end the battle if there are crew members waiting to be revived. It doesn't you need to disable the clonebay too even if they are all dead. Hwo Thumb wrote: Favorite layouts, anyone? I haven't decided if I like the Kestrel B or Federation A better. The artillery beam on the Federation cruiser cleans up ships with high shields, so you can save all the scrap you would be putting into weapons for shields, engines, and defense drones to protect yourself. It's a lot slower, but It's also the only ship that's gotten me to stage three of the flagship so far. The Kestrel B is a lot faster, though. It's got a nice layout, four starting power in weapons (along with four single lasers, which work really well in the first few sectors) and a nice variety of crew. I've never heard of anyone actually liking the Engi B. It's my absolute least favorite, followed closely by the stealth cruisers. It's probably the only ship that, in its initial form, can never deal with more than one shield point. Actual favorite: mantis A. I'm all about boarding and killing. Honestly, I wish there was more challenge to it. Once you have a few mantises with solid skills nothing can stand against you except drone ships and maybe Zoltan. There's never a challenging boarding fight until the flagship, and the advent of the hacking module makes even that one pretty easy. Spambot5546 wrote: Actual favorite: mantis A. I'm all about boarding and killing. Honestly, I wish there was more challenge to it. Once you have a few mantises with solid skills nothing can stand against you except drone ships and maybe Zoltan. There's never a challenging boarding fight until the flagship, and the advent of the hacking module makes even that one pretty easy. 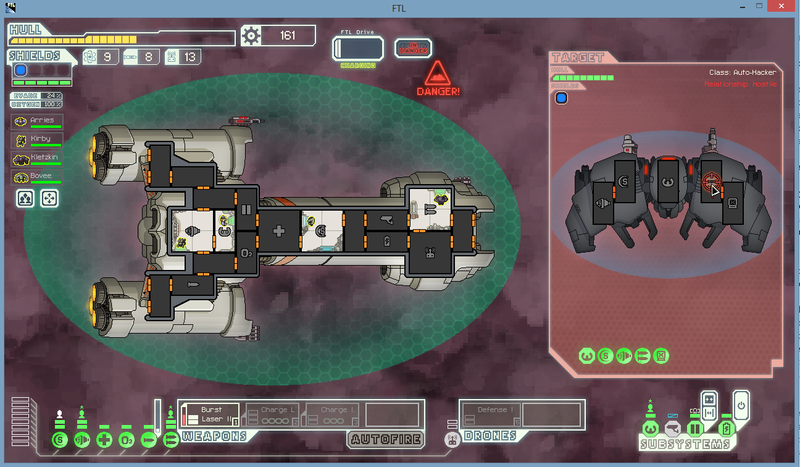 My first meeting with a Lanius ship on a run in which I was relying on boarding to win battles was highly unpleasant. Spambot5546 wrote: I've never heard of anyone actually liking the Engi B. It's my absolute least favorite, followed closely by the stealth cruisers. It's probably the only ship that, in its initial form, can never deal with more than one shield point. Personally, I've always felt that boarding is too risky, now that you can use mind control instead. Also, the introduction of the Lanius forces mantis ships to completely avoid entire sectors. The flak cannon is probably my favorite addition to the game. It's so useful, because even with its poor accuracy, it's incredible at getting rid of those pesky T4 shields. Conversely, I hate playing against flak cannon. It's the cause of about 90% of my lost battles before sector 8. I was doing a run with the Zoltan A ship yesterday (during which I unlocked Zoltan B). I was doing really well - had my 3 starting Zoltans, plus Rock and Mantis recruits as a boarding team. I was running on minimal reactor power, using the Zoltans and a battery for extra energy, because I was going for the 'get to sector 5 before upgrading the reactor' achievement. Then at some point in sector 4, after a minor battle, I sent my guys to repair the damaged doors and hacking, and went off to make myself a snack. Returned to find all the Zoltans had asphyxiated, because I'd been using one to power the life support and had sent him elsewhere for repairs. Just about managed to limp my way to sector 5 for the achievement, but it completely doomed my run. And then I was destroyed by a ship with and a flak cannon, a medbay and 4 crew (so I couldn't kill them by boarding fast enough). Adacore wrote: Conversely, I hate playing against flak cannon. It's the cause of about 90% of my lost battles before sector 8. I was doing a run with the Zoltan A ship yesterday (during which I unlocked Zoltan B). I was doing really well - had my 3 starting Zoltans, plus Rock and Mantis recruits as a boarding team. I was running on minimal reactor power, using the Zoltans and a battery for extra energy, because I was going for the 'get to sector 5 before upgrading the reactor' achievement. Then at some point in sector 4, after a minor battle, I sent my guys to repair the damaged doors and hacking, and went off to make myself a snack. Returned to find all the Zoltans had asphyxiated, because I'd been using one to power the life support and had sent him elsewhere for repairs. .
Once I accidentally killed my entire crew save for my one Lanius because I forgot that I had stolen a power bar from Oxygen to activate three drones and two weapons at the same time while maintaining my shield. By the time I realized the oxygen was dropping, it was too late. Finally beat the boss for the first time. Easy difficulty, normal mode (no AE stuff), using the red-tail. Final weapons included a heavy laser 2, heavy ion, breach bomb 2, and a halberd beam. Yeah, if you get strong boarders early, it can make a run much easier, unless you have terrible luck somewhere, since capturing ships rather than destroying them dramatically increases the salvage recovered. That's part of the reason I believe so many people love the Mantis ships. I've not managed to unlock then yet myself, though, sadly. Whoa, I never knew this was possible. Is this something that changed with the Enhanced Edition? I got it doing the same quest that gets you the Zoltan ship. Definitely always doing that quest in the future. I'm not sure what's special about that screenshot? EDIT: Oh wait, Zoltan shield on the Federation ship. Yeah, I think that was possible originally, although I'm not 100% sure. I vaguely remember getting it on the playthrough where I unlocked the Zoltan A ship, but that was a long time ago, so my recollection isn't great. Spambot5546 wrote: Whoa, I never knew this was possible. Is this something that changed with the Enhanced Edition? It has always been possible. My fave ships as of now are Federation A and Stealth A, because those are the only two I've gotten victory with. :L I think cloaking is pretty good, especially for the last phase of the Rebel Flagship. I love how the randomness in this game forces you into new strategies. I usually end up with a slower, defensive approach to the final boss - boot up some defense drones and spam full shields, teleport in some boarders to take out the weapons, and then when it's all done, finally start focussing on actually doing damage. This last time, on a Stealth A run, though, I went balls-to-the-wall offense, and it worked really well! Two combat drones, shield hacking, Flak 2 and 5 shots worth of laser spam, all Pre-Ignited, let me take out each boss form by my third volley. Good thing, too, because every time I finished a stage, it'd be just after something cleared my shields and set everything on fire, so it'd take me a while of careful recovery to get back in fighting shape each time. If I'd needed even a single additional volley I'd probably have died. Exciting! Almost done unlocking alternate ship forms, too. Just gotta unlock Rock B and C, then Lanius B and Crystal B, and I'll have them all. Then I need to get a victory with every form, and hopefully finish all the Ship Achievements. I doubt I'll finish the Rock's "Unlock the Crystal Cruiser" cheevo until getting form C, unfortunately, because I've only completed the full Crystal quest *once* in my ~150 hours of playing. I just went back to play FTL having noticed all the new additions (I played it near release) and I forgot how damn hard it is on normal. The times where I was like "Yeah it's going so perfectly" end with "oh jesus christ, what an unfortunate chain of events". Also it's kind of annoying that you can beam someone off an enemy ship and have them leave the teleporter room before dying to their attack. It's like... surely I beamed them away in time if they were still alive enough to move around on my ship before dying. On the other hand, on one of my recent runs, I encountered Giant Spiders 3 times, attacked them every time, and didn't lose any crew (no, I didn't have Cloning Bay nor Anti-Personnel/Boarding Drone) - and ended up winning that run. The Stealth Cruiser I found was okay once I managed to buy shields (which was pretty early). The mini beam is not that bad I think because of the low cooldown. I honestly forgot what other weapons I had with it but they were pretty strong, and the mini beam made sure I could deal damage in between the stronger weapon shots. Another cool ship is the Lanius Cruiser B. It's better at boarding than the Mantis Cruiser (and coincidentally the one I used to get it). Weeks wrote: The Stealth Cruiser I found was okay once I managed to buy shields (which was pretty early). The mini beam is not that bad I think because of the low cooldown. I honestly forgot what other weapons I had with it but they were pretty strong, and the mini beam made sure I could deal damage in between the stronger weapon shots. The avoid 15 points of damage one is doable in the boss fight. With the beacons it's just luck I guess, but I got that one easily. The 1-shot from cloak is obtainable by taking one level of cloak with starting money and finding the weakest drone. That's definitely just luck. You *do* start with Long-Range Scanners, so you can tell when something has a hazard before you jump to it, but when I was trying to get this cheevo I had three consecutive games where *every* neighbor to one of the exit nodes had a hazard. Yeah, I've unlocked the Stealth B (and C) now - got a Glaive(?) Beam drop early in Sector 1, then found Stealth Weapons in a store, so was one-cloak killing enemies into Sector 4 or 5, and got a hazard-free route through too. Playing with the Stealth B, I picked up a Zoltan Shield before getting an actual shield, and went boarder - one of my worst playthroughs in terms of skill, ending up losing about 8 crew members on the way, mostly through carelessness in boarding actions - usually, I wipe out most of the Boss's crew during the first form; this time through, I had a couple of boarders when I finished the fight, as well as several still alive in the main body of the enemy ship. Just the Slug B left to beat the Boss with before I get the alt unlock on the Crystal Cruiser - and there are some C ships yet to unlock too. I think I'll try to get the Crystal Cruiser through quest, the alt unlock seems rather tough. Especially with that damned Rock Cruiser. I hate missiles. I finally got the Crystal Cruiser last week by beating the game with each ship's A and B. It's a LOT easier than trying to get it through the quest. The quest basically never happens, there are too many factors that have to line up. I'm trying to get it with Rock C - at least then you only have to worry about finding Rock Homeworlds. Spambot5546 wrote: I finally got the Crystal Cruiser last week by beating the game with each ship's A and B. It's a LOT easier than trying to get it through the quest. The quest basically never happens, there are too many factors that have to line up. - A way to damage it (missiles, lasers, flak) - also useful for unmanned drone ships during normal play. Fun fact: those are also the things you need to beat every other ship*.